Dubai: New Zealand clung on for a dominant 21-5 win over the United States and a record seventh men’s title as the Emirates Airline Dubai Rugby Sevens concluded at The Sevens ground on Saturday. Winners of the Dubai Sevens on six previous occasions — the same as South Africa — the All Blacks had to dig in deep en route to their success in the 11th final here. Playing without the skills and experience of injured skipper Scott Curry, Akuila Rokolisoa, Regan Ware and Sam Dickson, the All Blacks first fought hard for a gutsy 7-5 win against former four-time champions England in the semi-finals before capping off their all-win record for the weekend against the plucky Americans. After a testing four minutes, it was Lukarisitone James Ng Shiu who gave the world champions a 7-0 cushion at half-time. When play resumed for the final seven minutes, the Americans cashed in a sin bin on Luke Masirewa to pull a try back through Stephen Tomasin. With fatigue playing a crucial part, it was Dylan Collier pushing the All Blacks Sevens clear at 14-5 with 2.36 minutes remaining. They added one more in the final seconds as Ngarohi McGarvey Black ran through from the left for a famous seventh win. 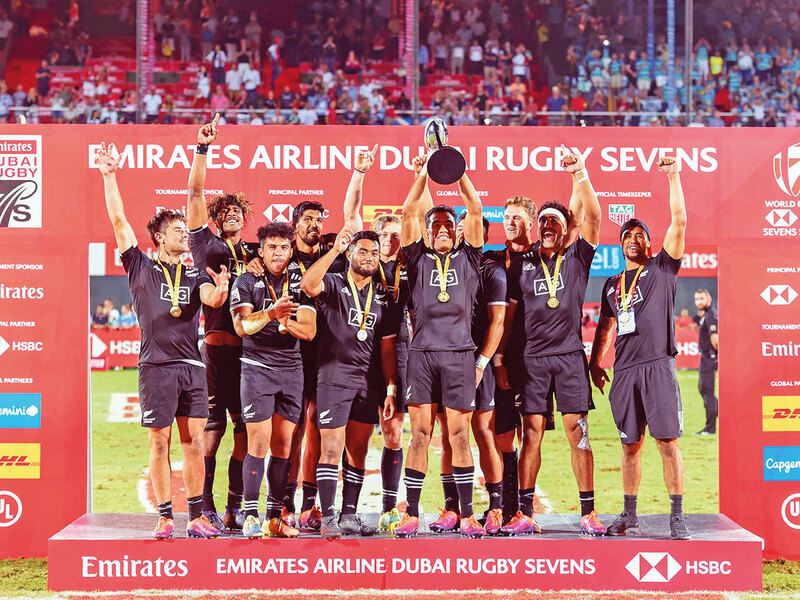 The All Blacks Sevens boast the best record in the Dubai competition, having won it on six previous occasions — starting with four straight titles from 1999 to 2002 and followed by another two in 2007 and 2009. They were also runners-up on four occasions in 2003, 2006, 2012 and 2017. However, this weekend was theirs as their bench strength shone through, especially in their semi-final against England where they clung on desperately to a narrow two-point lead. The path for New Zealand perhaps was cleared somewhat earlier during the morning after two-time defending champions South Africa crashed out to a shock 5-22 quarter-final defeat at the hands of England. The second semi-final, meanwhile, went close until Danny Barrett nipped in from the left to score a try during stoppage time and help USA over the line 22-17 against Australia. 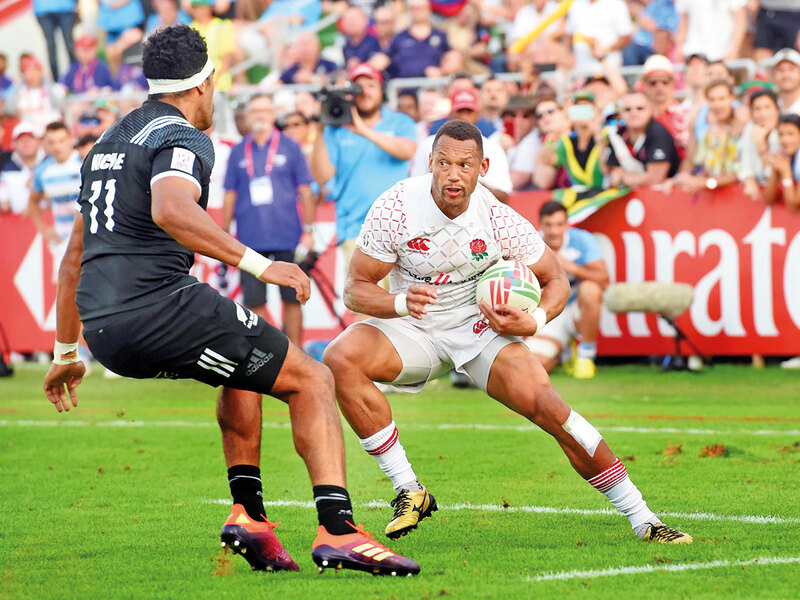 Earlier in the morning session, a couple of early setbacks made headlines — South Africa fell 5-22 against England while Olympic gold medallists and former two-time champions Fiji caved in to the USA 12-24. “That’s just not rugby,” an infuriated Blitzboks coach Neil Powell told Gulf News. “We didn’t even get our basics right out there. We had to keep possession of the ball and we didn’t,” he added. South Africa had secured a well-contested 24-12 win over traditional opponents New Zealand in last year’s men’s final for their second successive crown — their sixth overall here. The fight for positions also witnessed some exciting play with Harry Glover’s first-ever try in Dubai this year handing out a 15-14 win for England against Australia, while South Africa ended their defence on a low note after an Aminiasi Tuimaba try during extra time handed Fiji a fifth place pushing the Africans to a disappointing sixth.